The motivation for this post was the August Baking Challenge by Tessa of Handle the Heat. Tessa presented a recipe for bakers to make and share. It wasn’t vegan but that was simple enough to change. And, because there was no baking involved, high altitude adjustments were not necessary. The vegan substitutions I made were to use vegan margarine in place of unsalted butter, vegan cream cheese for the cream cheese, and soy creamer instead of heavy cream. 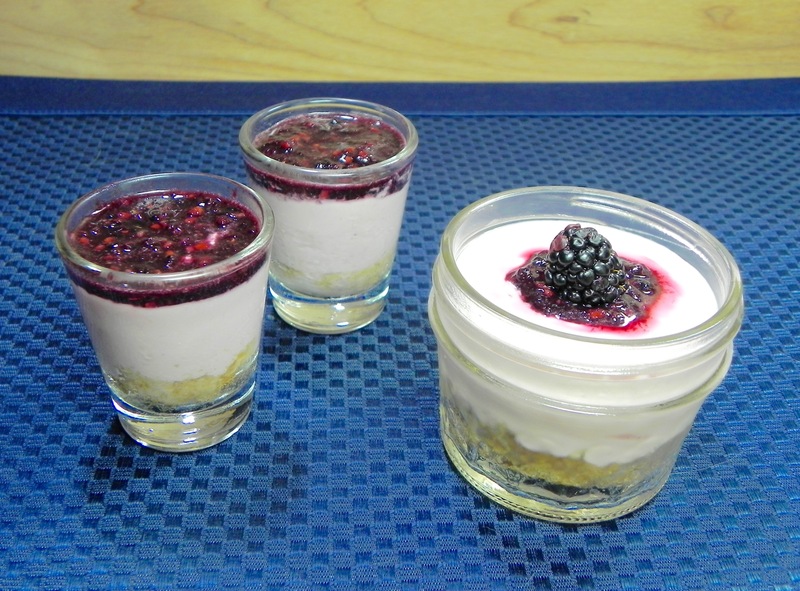 Another alteration I made was to put the cheesecakes in jars. Vegan dairy substitutes are often runnier than their dairy counterparts and make goopy cheesecake. I created a few in small mason jars where all they would require the eater to have was a spoon. The rest ended up in shot glasses for a fun party treat. For the crust: Place graham crackers in the bowl of a food processor and pulse until finely ground. Add in melted margarine and pulse until moistened. Divide mixture among jars or glasses. Firmly press into the bottom of each cavity. For the cheesecake: In the bowl of a stand mixer, beat cream cheese and sugar on medium-high speed until creamy and well combined. Add in creamer, lemon juice, and preserves and continue beating for 2 to 3 minutes, until well combined and thickened. Pour mixture over crusts and cover with plastic wrap. Chill until firm, at least 4 hours or overnight. For the topping: Combine berries, sugar, and lemon juice in the bowl of a food processor and pulse until pureed. Top each cheesecake with a dollop of sauce. Garnish with whole fresh blackberries. Lately it has been too hot to turn on the oven, but I had to make something patriotic for this week’s American Independence Day. My search came up with a no cook cheesecake with wonderful ripe summer fruit. It sounded like a perfect way to celebrate without heating up the kitchen or myself. The recipe was already vegan, so that box was checked off. No bake meant no high altitude changes. So, to put my spin on the recipe, I made it a bit healthier by replacing white sugar with dates and agave syrup. I also made it multi-layer and added blueberries for the blue. I know they can look more purple than blue when blended, so I kept the blue holiday theme by arranging blueberries on top in the shape of a star. Place yogurt in a cheesecloth-lined strainer set over a bowl. Let drain in fridge for 10 hours or overnight. Discard the strained liquid. Pour boiling water over dates and soak for 10 minutes. Drain and remove pits. Place dates in a food processor with walnuts. Mix until they come together in a sticky ball. Press this mixture into the bottom of an 8” springform pan. Place in refrigerator. In a bowl, stir together strained yogurt, agave, lemon juice and vanilla. Divide yogurt mixture into 3 equal portions and put each portion in its own bowl. Crush 1/2 cup of raspberries and stir into one of the bowls. Leave one bowl as is. Take the final bowl and put its contents in a blender. Blend with 1/2 cup of blueberries. Slice the 10 raspberries. Remove crust from refrigerator and spoon in raspberry yogurt mixture. Scatter sliced raspberries over the top. Place cake in freezer for 10 minutes to help to keep the layers from blending together. Spoon in the plain layer. Place cake in freezer for 10 minutes. On the top, spoon in blueberry layer. 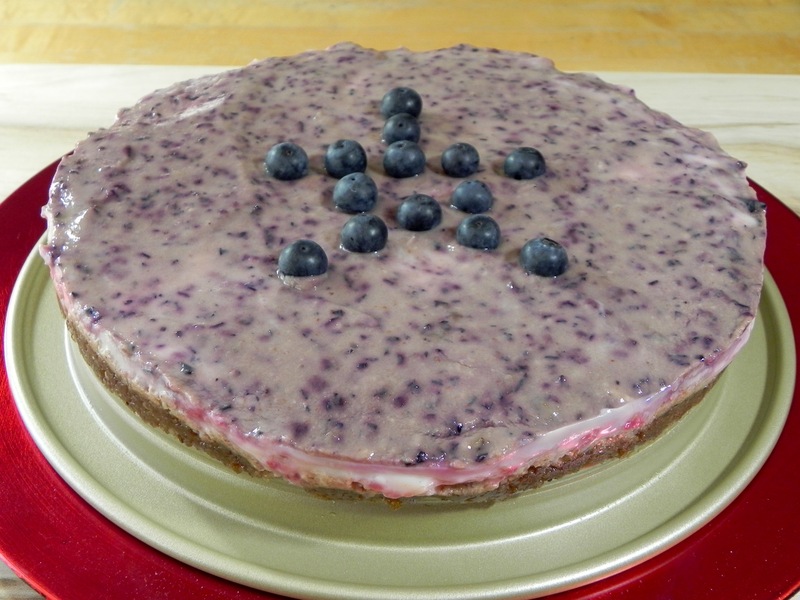 Place remaining blueberries on top of cheesecake in a star pattern. Cover tightly with plastic wrap, and chill for at least 4 hours, or overnight. Who doesn’t like coffee cake? It’s good for breakfast, snack, dessert; basically whenever you’d drink coffee. 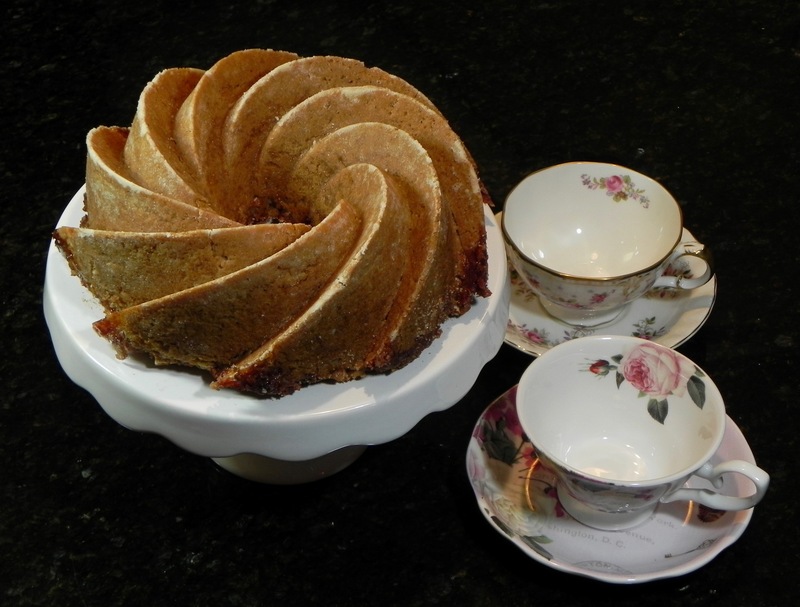 But I was craving a coffee cake with a little difference. The recipe I found included blueberries, but my inspiration took me to add assorted berries for color and flavor. The batter turned a swirling purple color that I enjoyed. Don’t be scared; it gets muted during baking. The recipe I looked to wasn’t vegan so I got the opportunity to try a different egg substitute – the chia egg. It’s made by adding ground chia seeds to warm water and letting it sit for 10-20 minutes to thicken. The result is gummier than flax eggs, so I can see recipes where it would be a problem but not this one. More substitutes were swapping butter and yogurt for non-dairy versions. 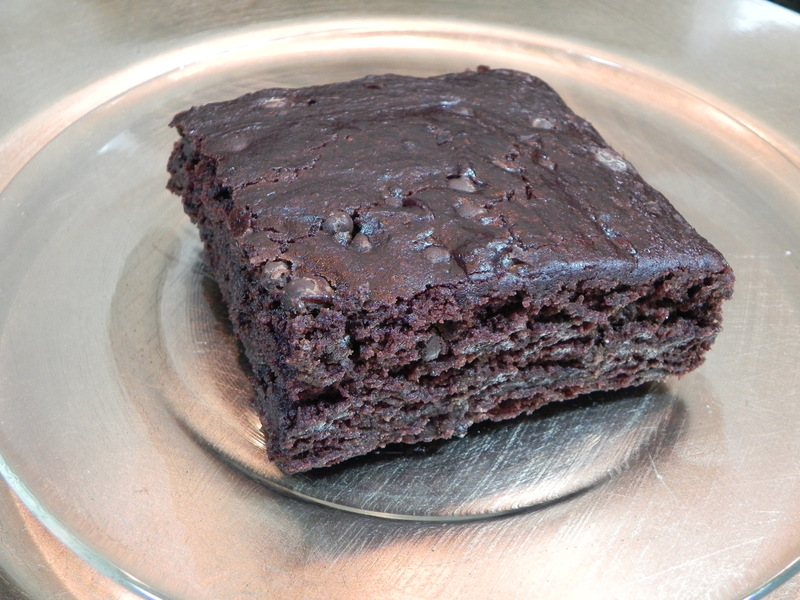 For high altitude I reduced the baking powder and added non-dairy milk. So, grab a cuppa joe and dig in. Preheat oven to 350F. Grease an 8×8” cake pan. Prepare chia eggs by whisking ground chia seeds into a bowl of warm water. Set aside to gel. Put 2 TBS whole wheat pastry flour, brown sugar, margarine, cinnamon and cardamom in a bowl and mix together with a fork until well combined and mixture is in large clumps; set this streusel aside. 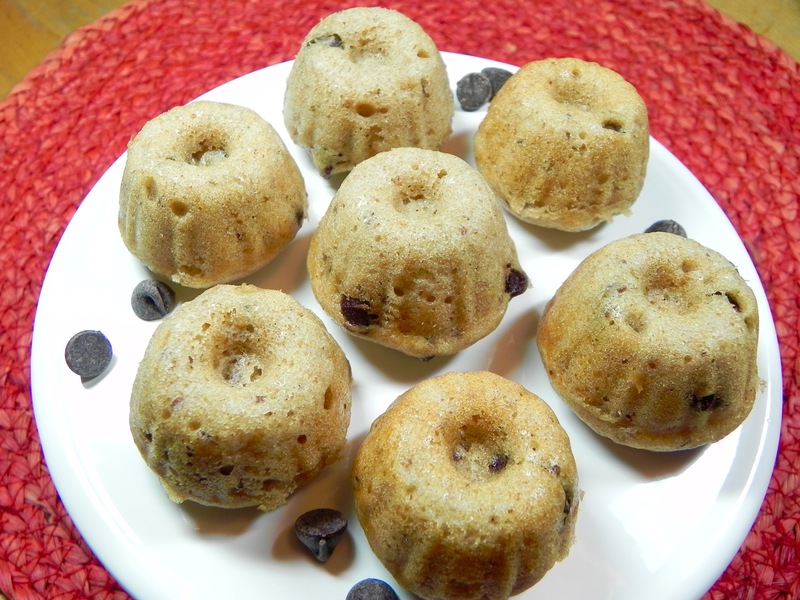 Put remaining 1 cup whole wheat pastry flour, all purpose flour, vegan sugar, baking powder, baking soda and salt in a large bowl and whisk to combine. In a bowl, whisk together yogurts, vanilla and chia eggs then pour into bowl with dry ingredients and stir until combined. Gently fold in 1 cup berries. Spoon batter into pan and sprinkle streusel over top. 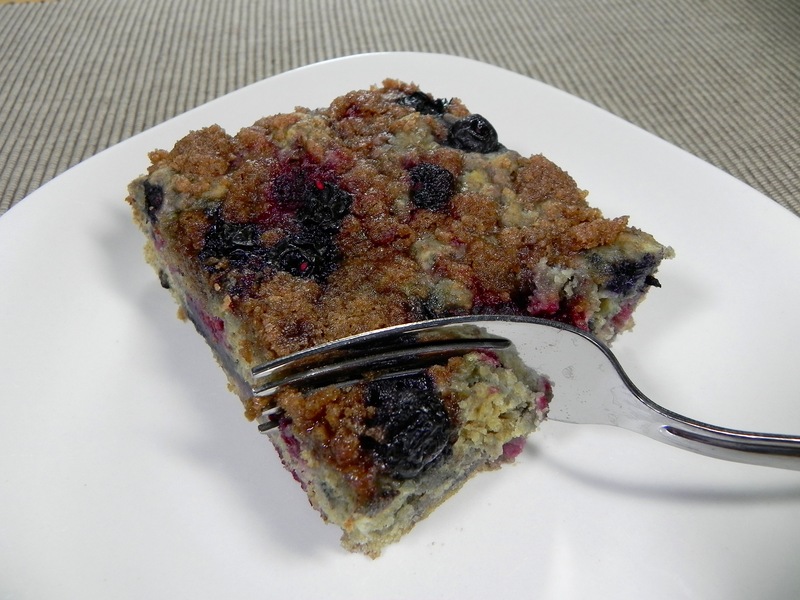 Scatter remaining 1 cup berries over streusel and bake until a toothpick inserted in the center comes out clean, 30 to 40 minutes. Once cooled, loosen edges of cake and transfer to a plate. Every once in a while I don’t really feel like baking. I want a decadent dessert that has my personal touch without my actually taking the effort to bake. So, what do I do? Semi-homemade to the rescue! I don’t normally endorse any particular brands, but Amy’s Kitchen makes a frozen Chocolate Cake that is vegan (and gluten free). With a few ingredients that I usually have on hand, I can transform the cake into a Decadent Vegan Baker original without any high altitude fuss. I have brought this creation to parties and fooled everyone into thinking that I slaved all day in the kitchen. Take the defrosted cake out of the packaging and slice in half horizontally. Spread jam over the bottom half of the cake and top with the top half, like a jelly sandwich. Melt chocolate in a bowl over a double boiler. Pour the melted chocolate over the cake sandwich. 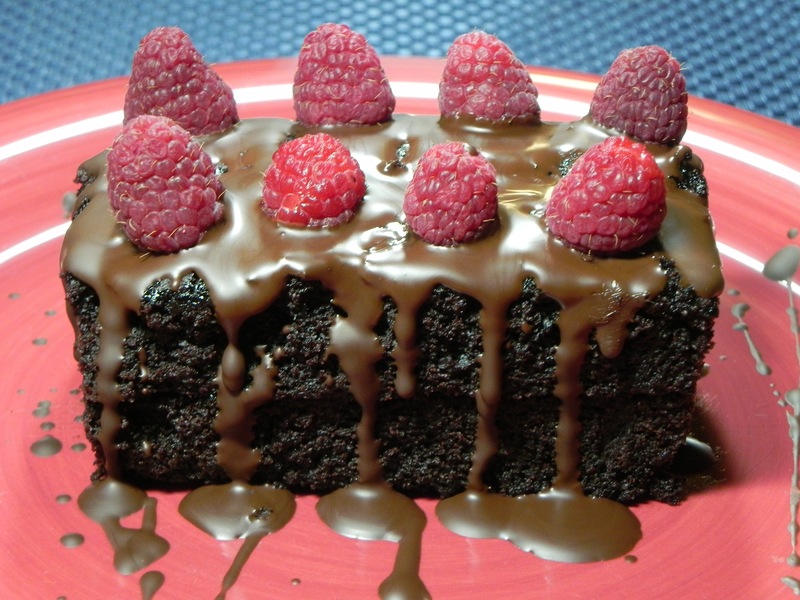 Top with fresh raspberries.